They’ve been punched, kicked and smothered on ships. They are the victims of the live export trade to Israel — and now they have an unprecedented voice in a ground-breaking new campaign. Vulnerable 10 week-old calves from Europe and cattle and sheep from Australia make up the hundreds of thousands of animals exported to Israel to be slaughtered every year. 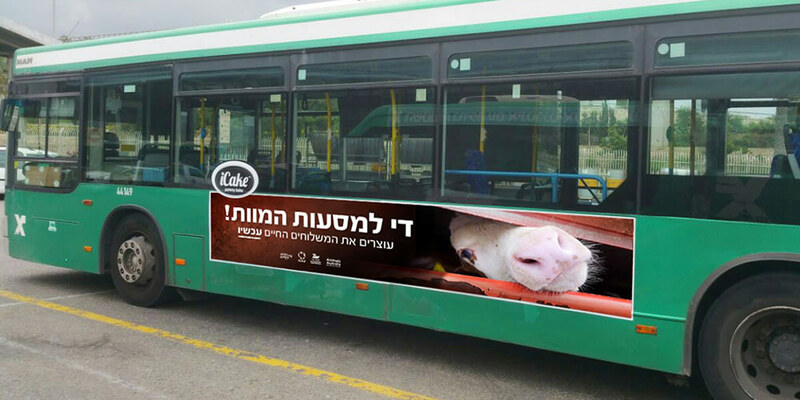 In a cutting-edge campaign, Animals Australia has united with animal protection groups in Israel — Anonymous for Animal Rights, Let the Animals Live, and Israel Against Live Shipments — to shine an unprecedented spotlight on the suffering of these animals. 'Stop the death ships' — these powerful words have turned heads at hundreds of prime locations across Tel Aviv. 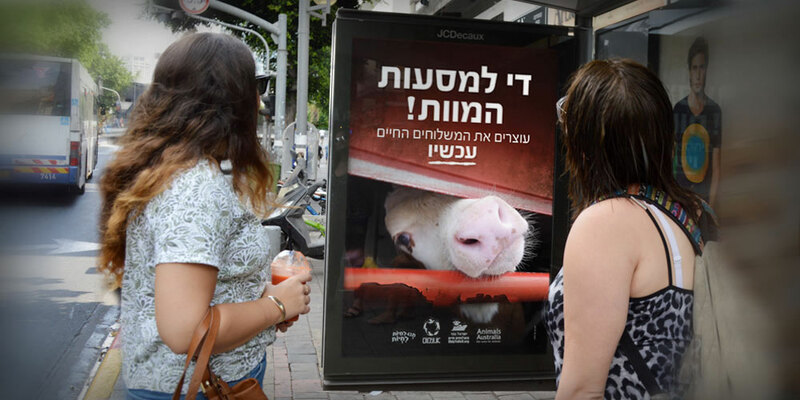 Throughout Tel Aviv, and Jerusalem — the home of Israel's parliament — over 200 buses hit the streets reminding Israelis of the suffering of exported animals and calling for an end to the trade. Gibor, the bull, faced extreme cruelty when offloaded from a live export ship in Israel. On top of this, five separate livestock shipments have broken down en route to Israel in the past three years, causing the suffering and deaths of thousands of animals. The abuse of sheep and cattle during unloading at the Port of Eilat has been documented by investigators on numerous occasions, and recently a veteran live export vet exposed the shocking conditions animals are subjected to during the three week voyage from Australia. While shorter, the journey from Europe is still steeped with risk and distress for the very young animals forced to endure it. Growing community awareness and opposition to the trade within and outside Israel is having an impact. The Israeli government's Animal Welfare Committee is unanimous in the view that live imports should end. And Israel's Minister for Agriculture, Uri Ariel, has committed to reduce the number of animals imported into Israel after a bill to end live imports was drafted in the Knesset (Israel's parliament). There has never been a more critical time in Israel to speak up for these animals. A decision by Israel to take leadership on this issue and say to the world that we no longer want to be part of this unnecessary suffering, would be celebrated by compassionate people internationally. Animals Australia's Lyn White speaking to members of the Knesset's Animal Welfare Committee in Israel in Jan 2016. We can only keep investigators in the field and bold campaigns like this in the public eye because caring people fuel our critical work on behalf of animals. Your kind donation today will help us stay where animals need us most.